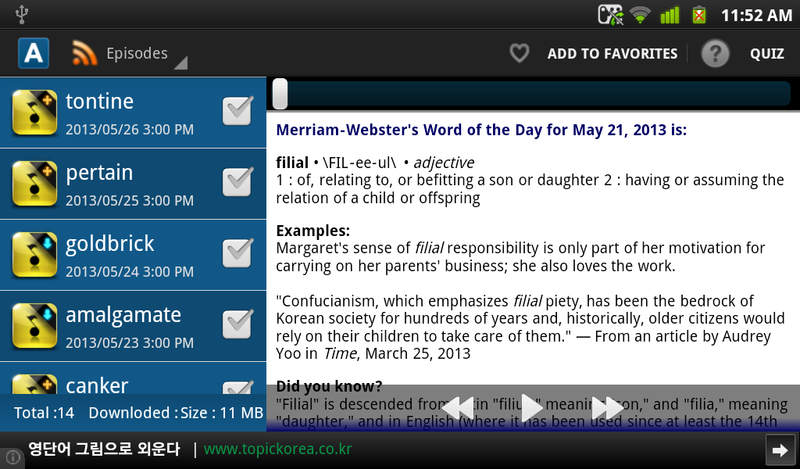 A Word A Day app has been wholly renovated with Jellybean user interface. Now it supports tablets on landscape orientation. Favorite tab will be useful when you'd like to retain your favorite words. To refresh word list, pull down word list like picture below. Please report if it doesn't work as expected by comment here or email. The rest of the update is fine, but I'm really not liking the new childish blue widget. Can you add the option to just have it white or black or something less in-your-face? V4.3 uploaded, check if it meets yours. Why do the words I've deleted reappear when I refresh? That's because the word is still on server and take days to unpublished. The fix is next agenda.